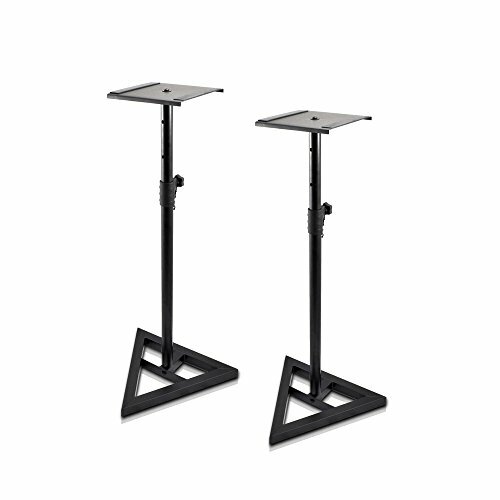 The Pyle PSTND35 heavy duty studio monitor speaker stand pair are designed to hold your speakers without worry. Perfect for on-stage, in studio or at home. Made of solid metal with arc-welded seems for structural dependability. Four locking height adjustment positions (Height Adjustment: 26''- 52''). Triangle base with floor spikes to assure stability. Sold as pair. SONOS SPEAKER COMPATIBLE: Pyle designed a pair of speaker stand according to the shape, aesthetics and black coat finish color of the Sonos speaker play 1. It works with both the SONOS PLAY 1 and PLAY 3 speakers in any orientation. HEIGHT ADJUSTMENT: It features a telescoping center column that is adjustable ranging from 26''- 52'' inch high and secure it with a sturdy pin. The rugged and durable metal construction assures structural stability. SQUARE PLATFORM: The SONOS speakers can be easily place at the 9'' inches square platform with 2mm thick and non-slip pad. It has 90 lbs weight capacity for each speaker stand. Perfect for any home theater space. THREE-POINT TRIANGLE BASE: It has equal 18''x 18'' x 18'' base plate to support solidity and safety of the Sonos speaker. It also has floor spikes with an equal heavy weight distribution makes the base extremely stable and secure. EASY TO ASSEMBLE: Pyle made sure that these Sonos speaker stands comes with necessary hardware for a hassle free assembly and mounting. More importantly, the company included an assembling manual for clear and precise preferences to use the stands.